as any other regions in South Korea there are many, many places to order food, noteably Chinese Soy Sauce Noodles called ‘JjaJjangMyon’ which have come be part of a Chinese-Korean synonym of Korean food-to-order since the developing days of the nation . counting up to the end of the Decade it has been fried chicken . and over the Millennium cakes and Korean side dishes as well as a whole bunch of groceries can be had ordering 6 hours in advance from your nearest supermart in eMart, HomePlus and Lotte Mart in the order of my preference . even though western AND arab eateries have sprung up around iTaewon and up the alley to Hyatt Hotel and over upon UN Village, there has yet to be a nice sandwich OR spaghetti delivered to your front door . one interesting place has my hand in taste as well as price, and this being iTaewon : open all-night long .. from 1pm to the wee hours of 4am . but it has its price I forewarn you, and it is HOT as in spicey hot . OK this is a hot firey chicken joint as its Korean cuisine name suggests “Bool Dalk” (fire chicken) first they were reluctant to lower the hot Korean red pepper in their sauce because it WAS supposed to be hot . but I guess they had similar requests over and after several tries they toned down a little but still quite hot . how hot ? well the first time I could go on after a few bites and sweating, had to wash off the whole plate with water, lame – but again, if you’re from warm California and your apartment don’t have enough heating in cold, cold Korean Winter ..
ofcourse you have another choice in pork which is only grilled and NOT hot but merely barbecue pork “DuaeJi BulGoGi”. 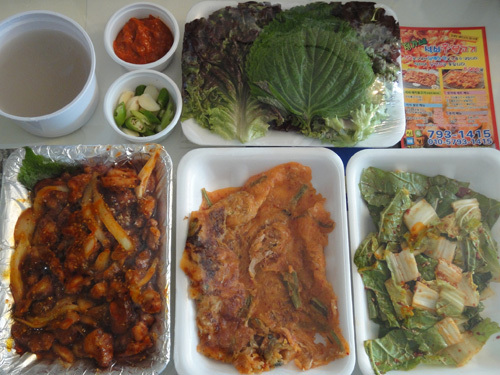 they come 30 minutes to an hour after the order by phone and in an assorted array of Korean side-dishes in the photo above . I would guess they work out of a home than a real store and is well done for must specialize as they have very little choice in menu . I would say ‘Medium’ is for two people and ‘Large’ for four for medium-portion appetite .